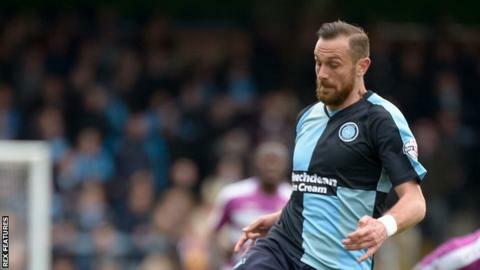 Paul Hayes scored his fifth goal this season to put Wycombe ahead. Andy Yiadom was on target at Barnet came from behind to earn a draw and dent Wycombe's League Two play-off hopes. Chairboys keeper Ryan Allsop saved John Akinde's header before Wycombe striker Paul Hayes hammered home from Michael Harriman's deflected header. But Barnet levelled when a bursting run from Elliot Johnson found Yiadom who fired home from six yards. The draw leaves Wycombe eighth, two points off a play-off place. Barnet, meanwhile, are safe in mid-table in 15th. "I got a reaction at half-time because Barnet caused us a few problems in the first half. "We are still in the hunt with four games to go and I think we need to win three of those games to be in the play-offs. It's a tall order but we have done things like this before. "We will be giving everything to go into these games to try to win them. "We had one shot to save in the second half and it goes in. Ryan Allsop has nearly saved it and he's upset he didn't save it, but that's the spirit we've got here." "I thought we played very well in the first half. We had several chances to go ahead and I don't think they had any. "We were more than comfortable from start to finish apart from one long free-kick that bounced into our box. "We thoroughly deserved to score the equaliser, and overall on the scale of things, I would have said that Barnet deserved to win that game, comfortably." Match ends, Wycombe Wanderers 1, Barnet 1. Second Half ends, Wycombe Wanderers 1, Barnet 1. Substitution, Barnet. Bondz N'Gala replaces John Akinde. Substitution, Wycombe Wanderers. Rowan Liburd replaces Paul Hayes. Attempt missed. Aaron Pierre (Wycombe Wanderers) header from the left side of the box misses to the left. Corner, Wycombe Wanderers. Conceded by Michael Nelson. Bira Dembélé (Barnet) is shown the yellow card for hand ball. Hand ball by Bira Dembélé (Barnet). Foul by Shaun Batt (Barnet). Sam Togwell (Barnet) wins a free kick on the left wing. Substitution, Barnet. Shaun Batt replaces Michael Gash. Substitution, Wycombe Wanderers. Gozie Ugwu replaces Garry Thompson. Attempt saved. Aaron Pierre (Wycombe Wanderers) header from the centre of the box is saved in the top centre of the goal. Corner, Wycombe Wanderers. Conceded by Harry Taylor. Corner, Wycombe Wanderers. Conceded by James Pearson. Substitution, Wycombe Wanderers. Jerell Sellars replaces Max Kretzschmar. Paul Hayes (Wycombe Wanderers) wins a free kick in the defensive half. Foul by James Pearson (Barnet). Goal! Wycombe Wanderers 1, Barnet 1. Andy Yiadom (Barnet) right footed shot from very close range to the bottom right corner. Assisted by Elliot Johnson with a cross. Corner, Barnet. Conceded by Aaron Pierre. Andy Yiadom (Barnet) is shown the yellow card for a bad foul. Attempt missed. Garry Thompson (Wycombe Wanderers) left footed shot from the left side of the box misses to the right. Hand ball by Luke Gambin (Barnet). Substitution, Barnet. Luke Gambin replaces Sam Muggleton. Goal! Wycombe Wanderers 1, Barnet 0. Paul Hayes (Wycombe Wanderers) right footed shot from the left side of the six yard box to the bottom left corner. Attempt saved. Andy Yiadom (Barnet) right footed shot from the centre of the box is saved in the bottom right corner. Attempt saved. John Akinde (Barnet) right footed shot from outside the box is saved in the centre of the goal. Harry Taylor (Barnet) wins a free kick in the attacking half.